"WeavesWorld" is a well-established, independent salon situated in Glasgow. 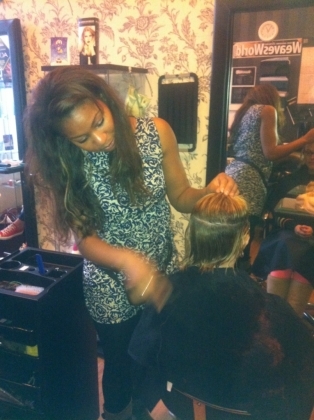 Our professional stylists provide a range of services from colouring and cuts, to braids and woven hair extensions. Our main priority is to provide a professional hair experience, in a welcoming environment, at an affordable price! "Long hair is a luxury so few women experience, my aim is to make it an accessible reality for all! Whether it has resulted through sickness or a hair accident, I wish to create the look of natural looking, beautiful hair, whilst preserving and growing your own hair beneath. What I offer is that alternative solution that should give you that crowning glory that you deserve." Here at WeavesWorld, we understand the demand for safe extension methods that are affordable for the average woman. Weaving, our speciality, is a highly technical skill that when performed properly has amazing effects on your hair, making it thicker, longer and show-stopping. It will also do wonders for your confidence, a great added bonus we think! Our aim here is to bring a realistic and affordable service to the community for women of all ethnicities and backgrounds to be welcomed into a warm and friendly environment. We also have a private consultation room for customers who require a little more privacy with their hair appointments. We pride ourselves on providing the best service we can, and with our friendly, professional staff welcoming you in,we guarantee a hair experience you will love! We are very proud of our staff and what they are capable of. From long, luxurious weaves to on-trend cuts and colours, you can be certain to leave with a hair experience worth showing off! WeavesWorld's success is not only down to the service we provide, but our amazing staff who strive hard to make their clients happy and satisfied with their hair. Our professional weave and hair stylist, Ivy is our very own founder of the salon. Having a passion for hair from a young age has resulted in an impressive 15 years experience in the field, with woven hair extensions being her specialty. She is a fully qualified stylist trained with L'Oreal proffessional and continues to stay on trend with current styles. For Weaves World, her ultimate goal is to provide a professional and affordable experience for the every-day woman so they can feel confident and have the look they desire. Working behind the scenes and being the first welcoming face you see in the salon, our receptionist Melissa is here to help you when you first book in and answer any questions or queries you may have. She's the newest member to our team but has settled in perfectly with the salon! Always on hand to help and always welcoming, she will make you feel right at home.